Simmer Spotlight - Why We Love The Sims! It's The Sims 17th Anniversary this week, and to celebrate it we're celebrating you, our amazing players! Yesterday, we asked What You Love Most About the Simming Community, and today we're back again with another doozy. Now we want to know WHY you love The Sims, and WHAT some of your favorite Simming memories have been! ItsLawpaws - I’ve played The Sims franchise ever since the release of the first game (I was ten, wow I feel old now ha! ), and I fell in love instantly. The thing I love the most about The Sims is that there are so many ways in which I can express myself and channel my creativity. Whether that’s creating Sims, experimenting with builds, storytelling in let’s plays, or trying to complete challenges. Recently, I’ve even delved into creating Maxis Match CC! It’s an amazing creative outlet, and it’s so refreshing to see others playing the game in their own way, because everyone has a different style. Lifesimmer - Another endless answer question! I really could go on and on. I'm glad that it's a sandbox game, you can create ANYTHING your mind desires. It's all about imagination and I personally feel that playing The Sims sparks my creativity and imagination, it's a game for anyone too. You have different aspects that would suit anyone and everyone. Say you're not really into role play but you adore building, you have the option to head into build/buy mode and do exactly that. In a way, it's your game, your story. You create the game how you like it. Luthienrising - It’s a great tool for creativity that leaves out the “work” side of creative work: I can make my own people and communities and stories without having to start from scratch and do everything. Between me and Sims, there’s a near-infinite number of stories that can unfold, something to suit any mood I might be in. It’s inexhaustible and it’s kept me coming back for 17 years. James Turner - The fact that the games can be so creative, or they can be as strategic as you like. 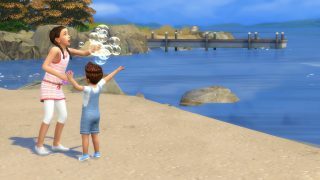 I can build some crazy structure, a house under a lake, or I can try my hardest to earn every skill and trait on a single Sim. The Sims really balances different types of play style well and allows you to play how you like, and that’s what I love about, and why I play it every day. MaryKateAn - I play The Sims constantly, from the beginning - from The Sims 1. Then, and now it still gives me a lot of joy. I love the freedom that game gives - everyone can choose their way of play, choose what to do in game. There is no predetermined scenario that you must follow. Furthermore, The Sims can surprise you with unexpected events! I love it! Fantayzia - That's a hard one, I love so many things about the sims. I absolutely love how creative it allows me to be. I love creating stories for my sims and watching it come together, every sim always has a different story. Deligracy - Killing Sims... I’m kidding (well kind of). I love building and telling stories. I also adore the humor and random things your sims will get up to when you’re not keeping a close eye on them! There’s always something new in the game that I will discover that surprises me. We definitely want to hear all of your fave Simming memories from the last 17 years too! Let us know on Twitter, Facebook, Tumblr and Instagram using #TheSimsAnniversary!